Take a virtual stroll through the Japanese countryside and view some photos of people and places in Japan, like the most famous castle in Japan, Himeji castle, where several samurai films have been shot on location, and the Tohoku region in northern Japan, known for its cold winters and beautiful outdoors. Whether there, or urban areas like Tokyo, each photograph portrays an unmistakable Japan, from its youngest inhabitants to those in their twilight years. Have a hankering for some Soba? Or just wanted to find that recipe for Miso Soup? Browse through the Food section to find out about some traditional Japanese dishes. Each dish includes an easy to follow recipe so you can prepare it at home. 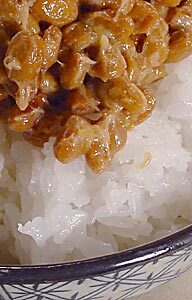 Photos and descriptions of all Japanese ingredients are available as well. Ever wonder what kind of rules a typical Japanese junior high school has? Like what hairstyles are forbidden to be worn? Or what socks need to be used? Find out in the school area, and while you're there, read some actual Japanese student notes passed around during class. Each note is folded in a unique origami shape mastered at a young age by these students. A World War II section includes a chapter from a junior high textbook. Decide for yourself whether Japanese know enough about their history. Everything is shown in the original Japanese with English translations.